The day after I left Yemen, the US Embassy kicked out all non-essential personnel after the 3rd bombing on Western targets in the last few weeks. Yemen was called Arabia Felix, meaning Happy Arabia in Greek. It is one of the world's oldest civilizations dating back to 1200 b.c. of the Minaean and Sabaean Kingdoms. Hadhramaut is named in the book of Genesis several times. Long ago Yemen was one of the richest places in the world at the center of the frankincense trade when the Romans invaded. The people, the architecture and the honey--35 bucks a kilo from Wadi Do'an in Hadhramaut--was some of the best in the world. Al Qaida is not active in Sana'a, but they do stop by from time to time. Every woman wears a burka and every man wears a tunic, a sportscoat, and a large dagger on a belt called a jambaya. The children go out of their way to say hello, and if they beg, a local adult will throw pebbles at the kids until they run off. Every person can say, "welcome to Yemen". Next door to the hotel--this camel walks in a circle to mill grain. A quote from the paper concerning the al-Husseiniah festival: "there were, and still are, many teenagers who can jump over six camels. What these young people need is some knowledge of sporting rules and then they might be able to compete on an international level and even break Olympic records." two boys on the roof of a house watching tv. Traffic was stopped by a city bus on the opposite side of the road today. At least a 2 kilometer train of cars was behind the bus. A man stood in front of the bus with his back to oncoming traffic---silly us, we thought he was fixing something. A closer look revealed a line of liquid going down beneath the bus. Then he zipped up his pants. He had stopped traffic to pee in the middle of the road during morning rush hour. Most walk-a-thon's I have attended involve real exercise, usually healthy food at the finish line and a generally healthy atmosphere. But unless that atmosphere has been cultivated as the norm, a walk-a-thon can be a very different event in another culture. 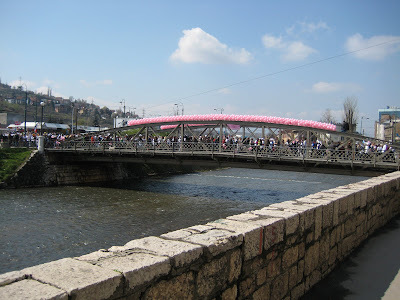 In Sarajevo, cigarettes, high heels and stops along the way for the pekara (bakery) and coffee were the norm. 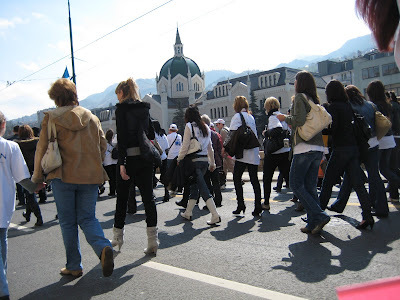 In their defense, this was the very first walk-a-thon type event in Sarajevo and I don't know that most people knew what to expect. It was sponsored by the International Womens Club and Avon in efforts to raise money for a mammogram machine for the hospital in Sarajevo. Sarajevo women wear high heels for everything--even to exercise apparently!